This cluster analysis website is primarily designed to assist marketing students understand how data can be used to form valuable market segments. Generally, a marketer will not need to understand the statistical and technical aspects of how cluster analysis performs calculations. Instead, a marketer needs to understand cluster analysis from a conceptual basis, essentially what it does, what outputs to look for, and finally and most importantly, how to form market segments. How does cluster analysis work – in simple terms? How does cluster analysis help in developing market segments? Do I need to use cluster analysis to develop market segments? What sort of data can I use in cluster analysis? What software can I use to run cluster analysis? What is a segmentation map? What is a segmentation profile? 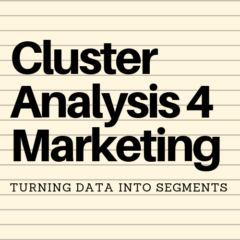 Cluster analysis is a helpful technique to assist marketers group consumer data into related sets and help form market segments. As we know, market segmentation and the selection of target markets is a fundamental starting point in the development of a marketing strategy and program – which is sometimes referred to as the STP process. Marketers do not need to know how cluster analysis is calculated (but it is outlined on this website if required). Marketers need to know how to use cluster analysis effectively and what key metrics and outputs they should be looking for. Put simply, cluster analysis is a statistical technique that is designed to group data (or consumer information in the case of a marketer) into similar sets. In other words, the data is “clustered” together around central points – if used successfully, these central points can become a key part of understanding market segments.